Original letter (partially illegible) at NASA OIG. Keith's note: Any typos are a result of the poor quality of the original letter - parts of which are illegible - released to the media by the NASA OIG - in clear violation of Section 508 requirements, by the way. I used OCR software and cleaned up as much as I could. 1 The Inspector General Act of 1978, as amended, 5 L.S.C. app. 3 8 4(a) (2) & (5). 'Provided, that notwithstanding section 505 of this Act. none of the funds provided herein and from prior years that remain available for obligation during fiscal year 2010 shall be available for the termination or elimination of any program, project or activity of the architecture for the Constellation program nor shall such funds be available to create or initiate a new program. project or activity, unless such program termination, elimination, creation. or initiation is provided in subsequent appropriations Acts." 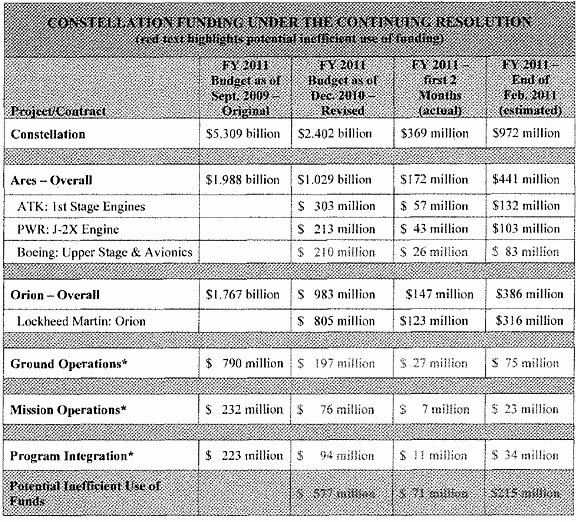 NASA's budget had called for it to spend $2.402 billion of the $3.7 billion Exploration appropriation on Constellation in FY 2011. In July of 2010, Congress placed an additional restriction on NASA providing that "notwithstanding any other provision of law or regulation. funds made available for Constellation in fiscal year 2010 for 'National Aeronautics of such Constellation contracts may not be terminated for convenience by the National Aeronautics and Space Administration in fiscal year 2010." Pub. L. No. 111-212. Both provisions are carried over in the current continuing resolution funding NASA and the rest of the Federal Government. the Federal Government are currently being funded by a continuing resolution (CR) that carries over these restrictions and prohibits initiation of new projects, NASA is continuing to spend approximately $200 million each month on the Constellation Program. aspects of which both NASA and Congress have agreed not to build. Without congressional intervention. by the end of February 2011 NASA anticipates spending up to $215 million on Constellation projects that. absent the restrictive appropriations language, it would have considered canceling or significantly scaling back. Moreover, by the end of FY 2011 that figure could grow to more than $575 million if NASA is required to continue operating under the current constraints and is unable to move beyond the planning stages for its new Space Exploration program. The limitation on NASA's ability to end Constellation-related contracts was discussed at a December 1, 2010, hearing of the Senate Committee on Commerce, Science, and Transportation chaired b) Subcommittee Chairman Nelson and attended by Ranking Member Hutchison and other Committee members. Senators at the hearing discussed developing options to address the restriction, but the CR enacted at the end of the last congressional session retained the limiting language. 4 On January 10, 2011 . NASA submitted to Congress a report required by Section 309 of the Authorization Act that describes the Agency's preliminary plans for developing this Space Launch System and Multi-Purpose Crew Vehicle. Recent media accounts have reported that the interaction of the 2010 Authorization Act and the CR will result in NASA wasting nearly $500 million on the Constellation Program through March 4, 2011.6 Given the mission of the Office of Inspector General (OIG) to prevent waste in NASA programs, we asked Agency officials to quantify their spending on the various aspects of the Constellation Program and characterize any effect the appropriations restriction has had on the may they have allocated these funds In sum, we found that by March 4 NASA expects to have spent up to $215 million on Constellation projects they otherwise would have considered canceling or scaling back absent the restrictive language in the CR. That figure could rise to more than $575 million if the CR remains unchanged through the end of the fiscal year. NASA has budgeted $2.4 billion for the Constellation Program through September 30, 2011. Senior NASA officials told us they have directed the majority of this funding to contracts for products. engineering and testing that they believe will most likely benefit the heavy-lift vehicle and crew capsule that will be developed pursuant to the 2010 Authorization Act. Specifically, ot the $2.4 billion budgeted for Constellation, NASA plans to spend $1.029 billion on Ares rockets and $983 million on the Orion crew capsule. For example, NASA officials said that of the four major elements of the current Ares program, two could be used in the new heavy-lift system: the first stage solid-fuel rocket engines and the upper stage liquid-fuel engine.7 Accordingly, NASA said it is focusing its spending on the two existing contracts related to these elements and plans to pay Alliant Techsystems Inc. (ATK) $303 million in FY 2011 to build a five-segment solid rocket booster engine and Pratt & Whitney Rocketdyne (PWR) $213 million for development of the J-2X upper stage engine. Conversely, NASA officials said they have dramatically scaled back funding for the third and fourth elements of the Ares program -the upper stage and related avionics, both currently being designed by Boeing - because those elements are less likely to he applicable to the new heavy lift system. In fact. NASA officials told us that absent the CR language preventing them from doing so, they likely would have considered canceling these contracts with Boeing rather than spending $26 million on these projects in October and November 2010. 5 in November 2010, NASA funded 13 private research studies as part of a Broad Agency Announcement to solicit alternative approaches for the next generation Space Launch System. Officials said they may reconsider their initial intention to use architecture similar to the Constellation Program for the new heavy-lift system depending on the results of these studies. 6 "See. e.g.. Mark K. Matthews, NASA has to keep defunct Ares rocket program going. The Orlando Sentinel. December 30, 2010. 7 NASA officials gave two reasons for planning to hew closely to the Ares rocket design: the time and cost that would be associated with designing and building an entirely new rocket and the directive in the Authorization Act that NASA should "to the extent practicable" utilize existing contracts and capabilities. Constellation Program. As a result. NASA officials believe very little of the $147 million spent on Orion during the first 2 months of FY 2011 would not have been spent even if the Agency were not bound by the Appropriations Act language. In response to our questions, NASA officials were only able to produce concrete figures on the amount the Agency spent on Constellation projects they would have considered canceling or scaling back but for the restrictive appropriations language for the first 2 months of the fiscal year (October 1-November 30, 2010). However, they indicated that it was very likely that spending in December would have been at roughly the same rate as the previous 2 months. As the table on the next page shows, by the end of February 2011 NASA anticipates spending $215 million on such Constellation projects. Moreover, according to Agency figures, NASA will spend more than $575 million on such projects if the CR is continued through the end of the fiscal year and the appropriations directive remains unchanged. 8 Before the President announced his intention to cancel Constellation in February 2010, NASA had originally planned to spend $790 million on ground operations for the program in FY 2011 . The Agency reduced that figure to $197 million for FY 2011 after the current CR was passed in December 2010. 9In September 2009, NASA had planned to spend $232 million in FY 2011 on mission operations for the Constellation Program. The Agency reduced the mission operations budget to $76 million upon passage of the CR in December 2010. 10In September 2009, NASA had planned to spend $223 million in FY 2011 on program integration, but reduced that budget to $94 million after the CR was passed in December 2010.
cc: Charles F. Bolden, Jr.
11The inspector Genera! Act contains a concept called a "Recommendation that Funds Be Put to Better Use" that strikes us as appropriate in this situation. The term refers to money that could be used more efficiently if management took actions to implement certain recommendations. In this case, we believe NASA could more efficiently use its funds designated for space flight if it were freed from the constraints in the 2010 Appropriations Act.